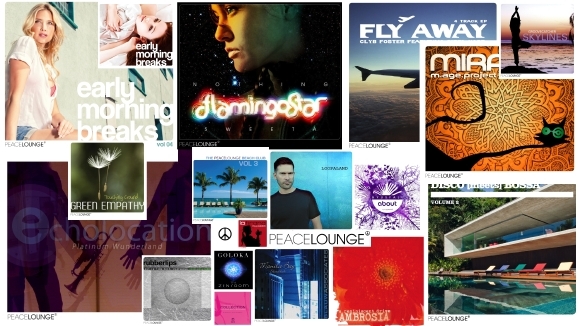 Since the year 2001, peacelounge represents an unrelenting passion for music, fun and dedicated work with artists such as Echolocation, Flamingo Star, Goloka, Green Empathy, Thomas Kessler, Loopaland, Clyb Foster, Dilek Taskin, Black Zone Ensemble, Sudaka, Massa Takemoto and Under Pressure as well as recent signings A Reminiscent Drive, Groovecatcher, Goloka, BoogieLab, Marcel Walter, Rubberlips and Jean Honeymoon. Thank you all for listening, liking, and sharing our music. If you are 'old-fashioned' and still buying CDs or downloads, look out for our releases in your local online store. EARLY MORNING BREAKS Vol 5 is coming later in 2015. Our aim is to provide an excellent and ecletic forum for musicians and DJs, open to the most diverse styles ranging from classical via Jazz to downtempo, lounge, relaxed electronics and world music to full-on House music with an Asian, African, Latin or deep flavour. We will be celebrating 15 years of peacelounge in 2016. Watch this space!